It's that time of year again...end of year testing! I know you have all been looking forward to it just as much as I have. Each year, right before test time, I start obsessing over what I can do to keep my students engaged, while also reviewing all of the objectives necessary to prepare for testing. I have found 2 things that have proven to do this for my students: task cards and technology. First off, I use these Common Core Task Cards to teach students vocabulary they may come across, in order to enhance their understanding of terms. I also use videos when teaching the vocab words, as this is a great way to introduce them, while also keeping the students engaged. You can find a freebie sample of these here! I also feel that it's important for students to be able to determine the correct type of text structure, which can often be challenging to do. Because of this, I try to begin teaching students this towards the beginning of the year. I see such an improvement in reading comprehension and students' ability to learn more specific content information once they grasp this material. Point of view is another important component that help students comprehend what they're reading more easily. Understanding the point of view from which the story is being told allows them to have a better idea of the characters in the story, and also enables students to think more in depth about how the characters change throughout the story. Students who have a strong understanding of the literary vocabulary, text structure, and point of view typically do better at comprehending the material they read. This is why I created this bundle- E/LA End of Year Test Prep! This product includes: 20 Point of View Task Cards, 13 Text Structure Task Cards, and 36 Common Core Vocab Task Cards. For a FREEBIE sample of this, please click here! This year, I've decided that the majority of our review will take place digitally, since we're lucky enough to have a class set of laptops. At my school, we use Google Classroom, but there are many programs that can be used if you don't have this (Edmodo, Canvas, Schoology, etc.). In order to do this, I created a digital version of my ELA Test Prep Task Cards- Google Drive Edition. 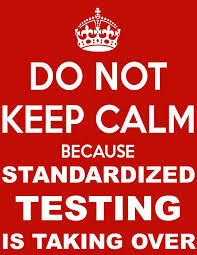 I would love to hear how you review for end of year testing! Share your ideas in the comments below.